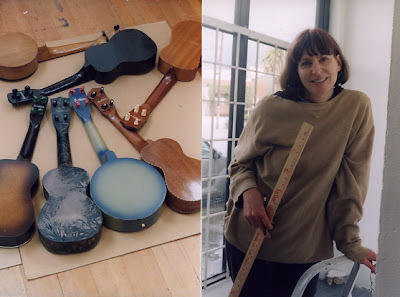 Photo of the backs of some of my ukes and a photo of me at Thinkspace measuring for the mural in the front room of the gallery. 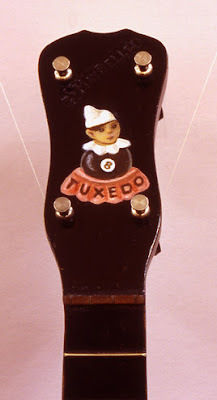 You can see the duco finish 1930's Stella uke, second from left. It's amazing-looking on the back! What a collection of fine specimens! 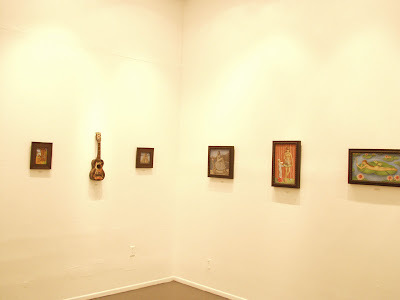 Only a few days left until my show closes in L.A. - last day is March 6, 2009. 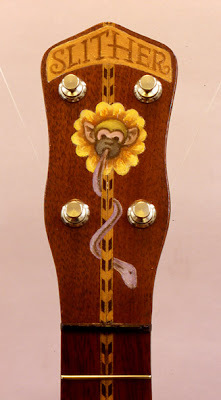 Here are the painted headstocks of the fine art ukes in my solo show, "Dreamgirls and Ukes". 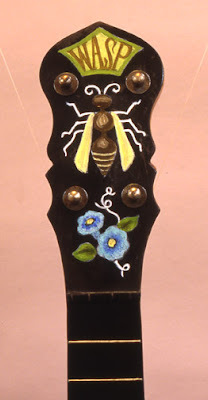 I came up with these names (and headstock logos) based on my paintings on the bodies of the ukes. 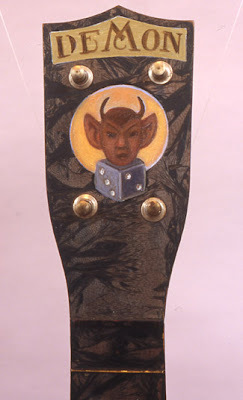 These are painted fine art "sculptures" that are also rare antique musical instruments. They all actually play and were set up by a luthier. 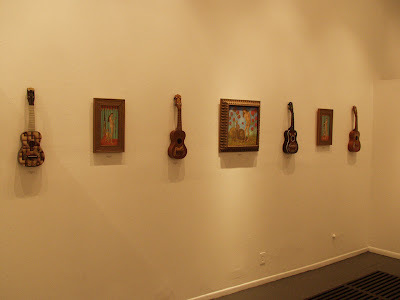 The ukes also relate to the framed oil paintings (on linen) in the show, using some of the same motifs on both. 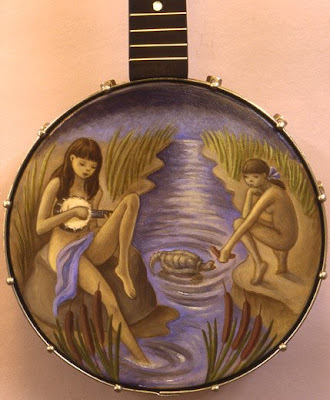 I wanted the show to be not only painterly, but literary and musical. Poetic, like surrealism and dada, yet also all about design, too. 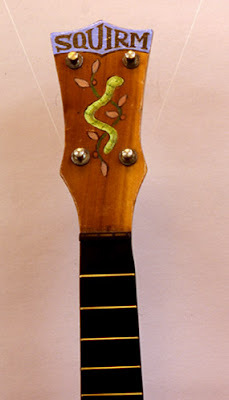 I can't tell you how much I enjoyed collecting and painting these ukes and having them restored. I saved them from the trash bin in some cases and also enhanced them. It's a miracle they have survived this long (some are 90 years old! 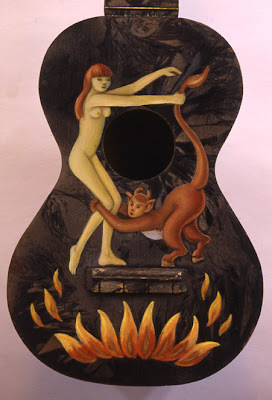 ), since many ukes have gotten destroyed over the years. Playing them wears them down, too, and it has always been up to the person who owns them what he or she will do with an old instrument. 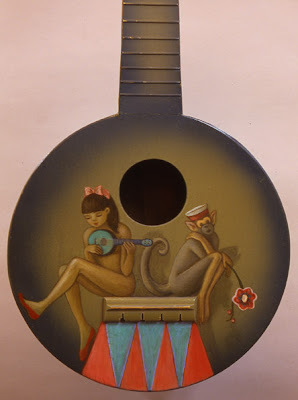 Mint condition ukuleles are ones that no one has ever really played, and because of that, we are able to experience them without seeing any damage. Some people just love to look at rare things. 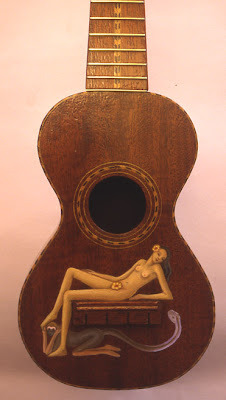 Some people love instrument design and wood. Some love to collect historic things. Some love fine art. And some love the sound of an antique instrument. These are all one-of-a-kind fine art objects. There will be no others like them. 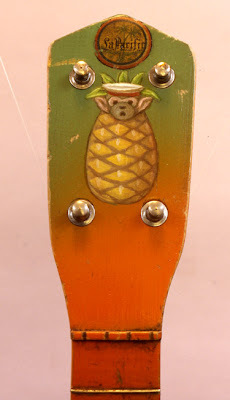 Some of the antiques ukes are so rare you will be hard-pressed to find another like it. 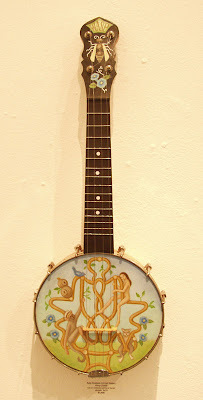 See my previous posts for the bodies of these instruments! 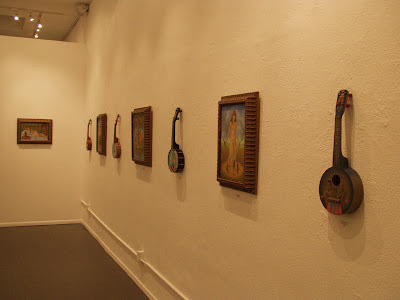 Here are close-ups of my painted designs on the bodies of my restored antique ukes in my solo show at Thinkspace gallery in Los Angeles. 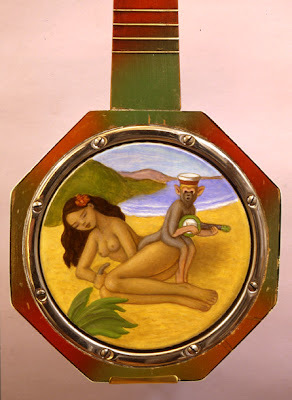 Some are painted on the original art deco backgrounds, some are painted on hide heads, and some are on mahogany or koa wood. 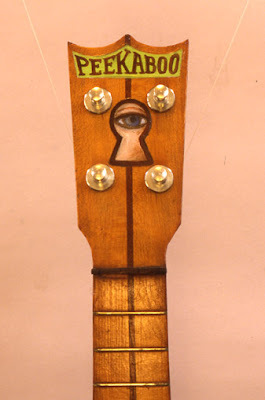 I will post the headstocks next. 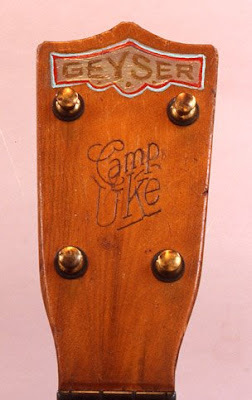 These ukes have all been restored professionally. They are mostly from the 1920's and 1930's. Some were already in near mint shape, but some had to be re-built, parts added or glued. I had so much fun thinking up the perfect design for each. 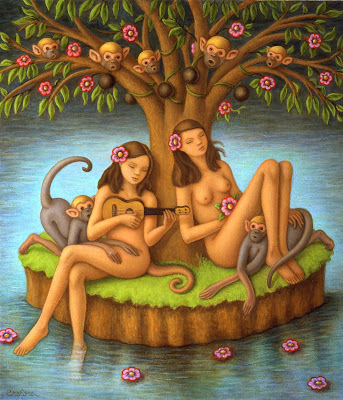 Thanks to Johnny at Drawn.ca for blogging about the ukes today. 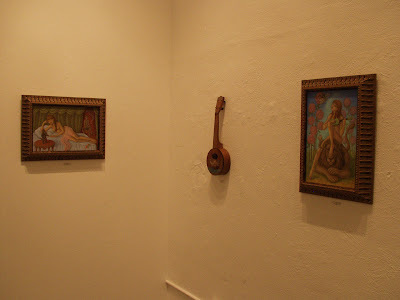 Here are four of the major works in my Dreamgirls and Ukes exhibit in Los Angeles, CA. 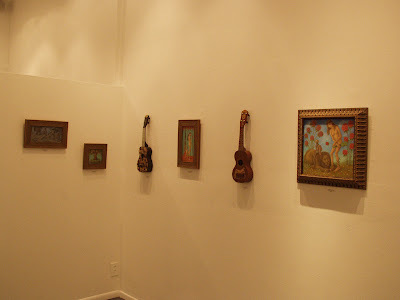 See these hanging next to beautiful antique, restored ukuleles that I also hand-painted with original designs. The effect is wonderful, I think. This show only runs until March 6th, 2009. 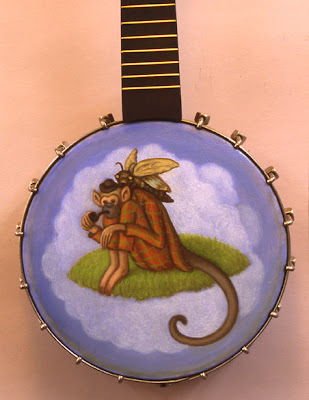 Sophie Madeleine plays the Beard Song on the ukulele. Couldn't get much sweeter than this. 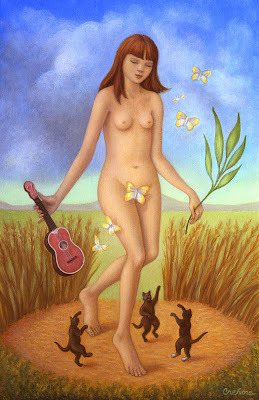 I wonder if she knows about my "Dreamgirls and Ukes" art show happening right now in L.A.? Corktown Ukulele Jam of Toronto, Canada does. They have a new "gallery" section on their website where they posted my entire flickr slideshow. Check out their wonderful website: HERE (torontoukes.com) Thanks, Steve! Some of those vintage portraits from the 1920's of Ziegfeld girls have hoops in them. 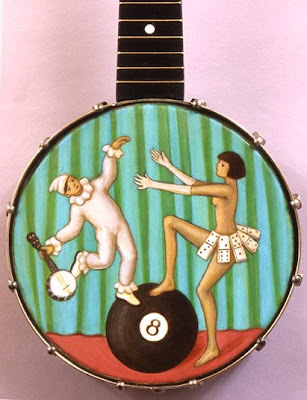 I painted my first hula hoop painting back in 2005 (one of my "Little Pierrots" called "Hula Hoop Blues") without realizing that it was a classic motif in the old photographs of Alfred Cheney Johnston. 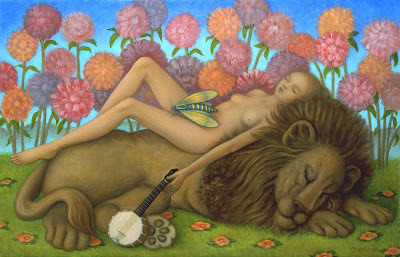 The pose in this "Hoop Dream" painting was inspired by one such photo. 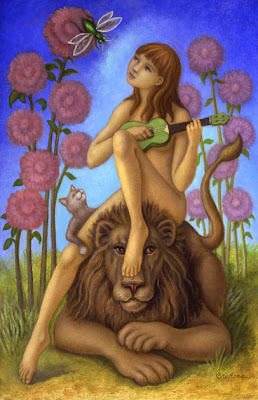 The bottom painting has a pose that I just made up with a funny little cat smoking, also from my imagination. 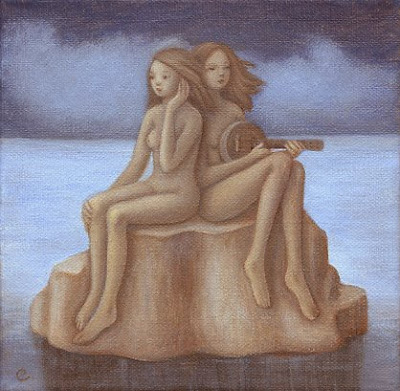 I thought it would be nice to make a pair of paintings that related to each other. See these at Thinkspace Gallery in L.A. until March 6th. "Please Don't Bug Me Blues" oil on linen by Amy Crehore 2009 12" x 18"
"Weed Smoker's Dream" oil on linen by Amy Crehore 2009 18"x 12"
"Stuck Here Blues" oil on linen by Amy Crehore 2009 14" x 14"
The lion is a nice, gentle guy at heart, but sometimes he is a bit rough. He's quite a large creature. Very comfortable as a bed or chair for our girl. But, she also wants to get away from him sometimes and finds that she is stuck and he is holding on. He would be sad if she escaped. 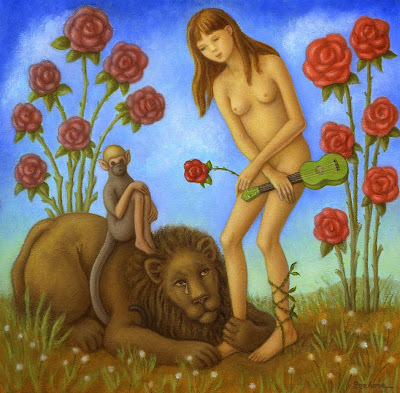 The monkey on the lion's back might represent his"addiction". And the roses seem to grow too wild and wrap around her legs (thorns) leaving a bit of blood on her ankle. 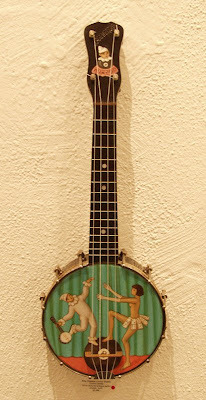 She's got her vintage ukes: the green one and an old banjo. And there are a couple of big flying insects hanging around - bugging her. The flowers are over-size lollypops. 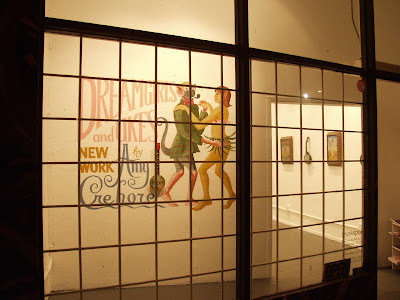 "Weed Smoker's Dream" is an actual title of a blues song from the 1930's by the Harlem Hamfats. See these at Thinkspace Gallery until March 6th, 2009. 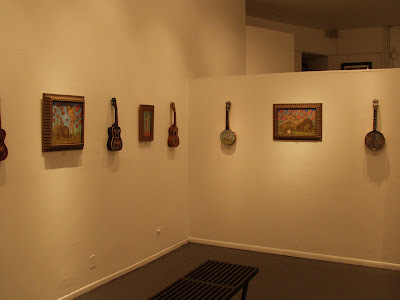 People really seemed to like the nighttime paintings I did for my "Dreamgirls and Ukes" show. 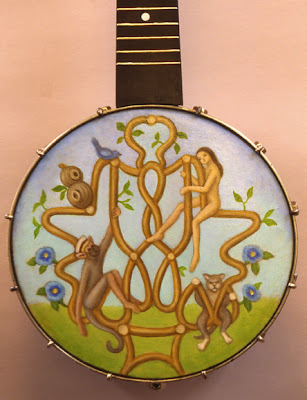 All of these are oils on linen except for the one on the antique banjo, which is oil paint on the original hide head (varnished). 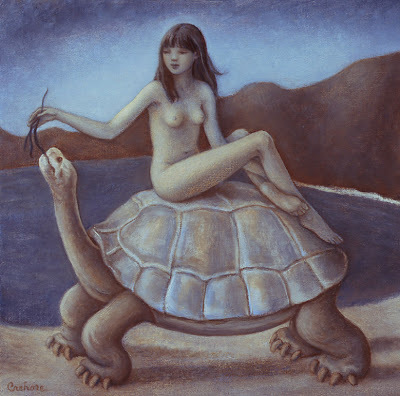 The big tortoise is a new character... from Galapagos Islands. The "Nighttime Ditty" is a version of my "Snake Tamer's Ditty" of 2007. Please feel free to comment and I will answer any questions you might have. All photos taken by Mark Lowrie. Click to enlarge. 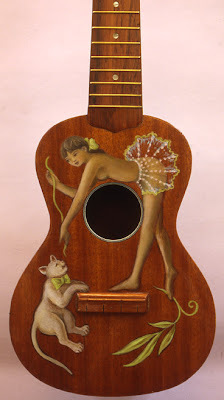 This is my "Dreamgirls and Ukes" show. This show only runs until March 6th, 2009. Gallery is open on Thurs, Fri, Sat and Sunday from 1-6pm. Please go see it if you live near L.A. ! 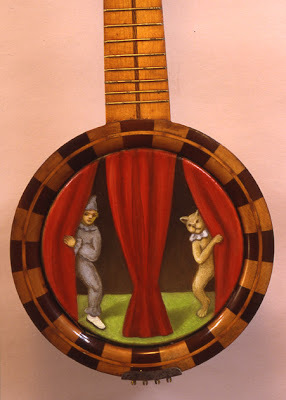 Feb 13- March 6 2009 - featuring oil paintings and fully restored, painted antique ukuleles. Anthony Clarkson's wonderful art is showing in the project room. 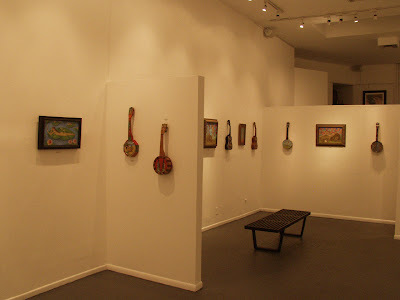 I was not able to take photos of the ukes all strung up before I left for L.A., so I sent the gallery photos of the ukes without the strings on them. 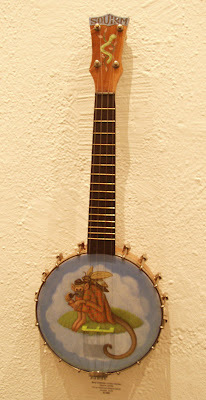 In some cases, such as banjo-ukes, the tailpiece/bridges were missing from the photos. 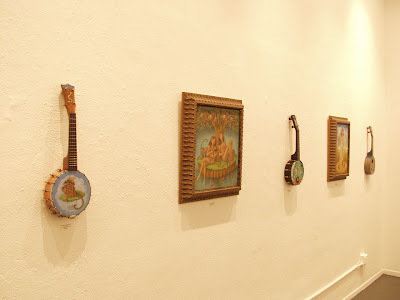 Here are some shots of the banjo-ukes on the actual wall of Thinkspace Gallery. 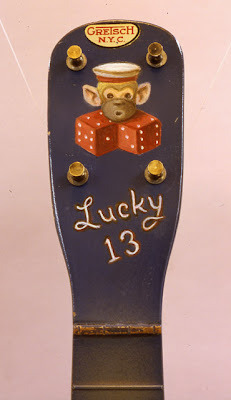 You can see them with strings, all fully restored and tuned by a professional luthier. 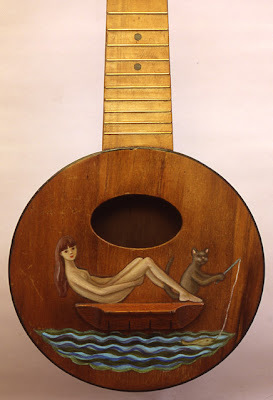 I will be blogging the rest of the ukes (with strings), so stay tuned. 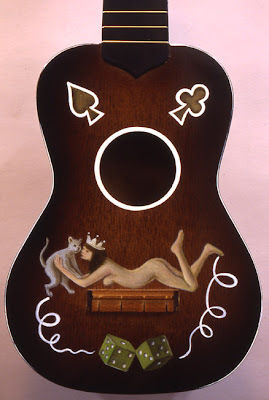 The real beauty of the "Dreamgirls and Ukes" show is that each uke is a real instrument as well as a fine art object. Each was lovingly restored to playability. 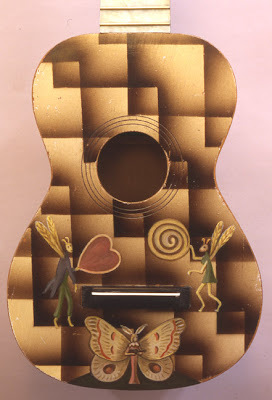 Some even have hand-crafted bridges and tailpiece (as in the case of La Pacifica). This show will be up until March 6th.